Sometimes we forget that the Montreal area, although very urbanized, is also an archipelago of a few hundred islands and islets as well as several streams and rivers. In this aquatic environment live a number of species, including the map turtle. This species is considered to be vulnerable according to Quebec’s Act on Threatened or Vulnerable Species. The plan will be implemented in coming years by NCC and other organizations working to protect this species. The adult map turtle's shell provides effective protection against predators. Despite this armour, they are also victims of injuries, sometimes fatal, caused by boat propellers. The shell also does not help shelter the species from the degradation of its habitat. The loss of nesting and basking sites are the main threat to their survival. The map turtle can be distinguished from other turtle species found in Quebec by the concentric yellow patterns on its shell. These patterns, similar to the contour lines used on geographical maps, are what lend this species its name. The female’s shell can grow to more than 27 centimetres. The male's shell rarely exceeds 16 centimetres. The map turtle lives in the most populated and industrialized areas of Quebec and Ontario. It can be found in large bodies of water, such as the Saint Lawrence River and Lake of Two Mountains. Since it dives into water when approached, the species often goes unnoticed. However, the species' population can be sizeable in certain favourable habitats. The disappearance of the map turtle and its habitat could have unforeseeable consequences on the food web of those species found in the same area. The protection of the turtle's habitat also directly contributes to conserving natural shoreline areas, maintaining water quality and reducing the chance of flooding. By implementing a conservation plan, NCC supports the achievement of objectives outlined by the Montreal Metropolitan Community (MMC) in its Plan métropolitain d’aménagement et de développement and its Plan d’action pour l’accessibilité aux rives et aux plans d’eau du Grand Montréal. The MMC’s objectives include the protection of the riverbanks, shorelines and plains that form the metropolitan area’s Green and Blue belts. 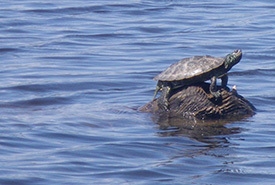 The conservation plan developed by NCC and its partners, including the Groupe de mise en œuvre du rétablissement de la tortue géographique, the Ecomuséum, the city of Montreal, Nature-Action Québec and Éco-Nature, provides concrete recommendations to protect and improve the map turtle’s habitat. These actions will help to decrease population loss and to reduce disturbance. The long-term objective is to maintain a viable population of this species in the Hochelaga Archipelago. The successful accomplishment of this goal depends on the collaboration of several stakeholders: citizens, boaters, private property owners, conservation organizations, municipalities, Crown corporations and governments in the area. How can you help the map turtle? Never disturb, touch or move a turtle or its eggs. Avoid removing tree branches and trunks by the side of the water. Learn to differentiate the map turtle from other species. Share any sightings of living, wounded or dead turtles with the Atlas des amphibiens et des reptiles du Québec (in French only). Reduce the speed of motorboats near banks and in shallow bays, to reduce the number of turtle collisions. Together, let’s take care of this fascinating species for future generations. Click here to see a short video on the map turtle made by the Ministry of Sustainable Development, Environment, Wildlife and Parks.